Man, when Macy's does their one-day sales they pull out the whole kaboodle. Saturday only they are offering storewide discounts up to 65% OFF. That's throughout every department in the store. Mind you, it's a pretty big store. Get a big deal on jewelry, bath/bed items like bedding and towels, luggage, clothing, shoes, furniture, appliances... they might even have groceries at this point. If you spend $99 or more they'll ship to your door for free. I'm honestly loving the furniture deals. I usually don't see this many discounts through this department. I can totally be down with a new patio set. I just need to get a patio first. 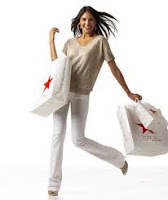 Click here to go to Macy's and shop.